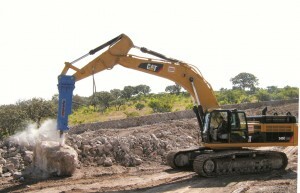 Hydraulic Rock Breakers are available from RJ Hydraulic Hammers and Heavy Parts. Are these the same product as a Hydraulic Hammer or a Hydraulic Concrete Breaker? Yes, they are absolutely the same product. Our knowledgeable, experienced equipment specialists will be able to assist you with any questions or concerns you might have about choosing the proper size breaker for your specific job and specific machine. We can answer your questions, no matter how you describe these attachments! We are experienced with matching the perfect sized breaker to fit your machine. We are available to assist you either by telephone or email 365 days a year. Please give us a call today at 1-888-651-0187.